Suitable for Master & Professional Performing level violinists. 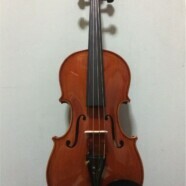 You are getting amazing value for money with this quality violin. Beautiful handpicked flame spruce pieces and handcrafted with care.